I made a batch of hard-boiled eggs early in the week, so that became my breakfast on most mornings. A hard-boiled egg, some bacon, and sliced grapefruit. A good start to the day! I’m going to try some Whole 30 smoothie recipes I found on Pinterest this next week, just for some variety in the mornings…I’ll let you know how it goes. I did try to mix it up a bit for dinners. Instead of meat or seafood, a vegetable, and a fruit, I found some Pinterest recipes that were actually quite tasty. 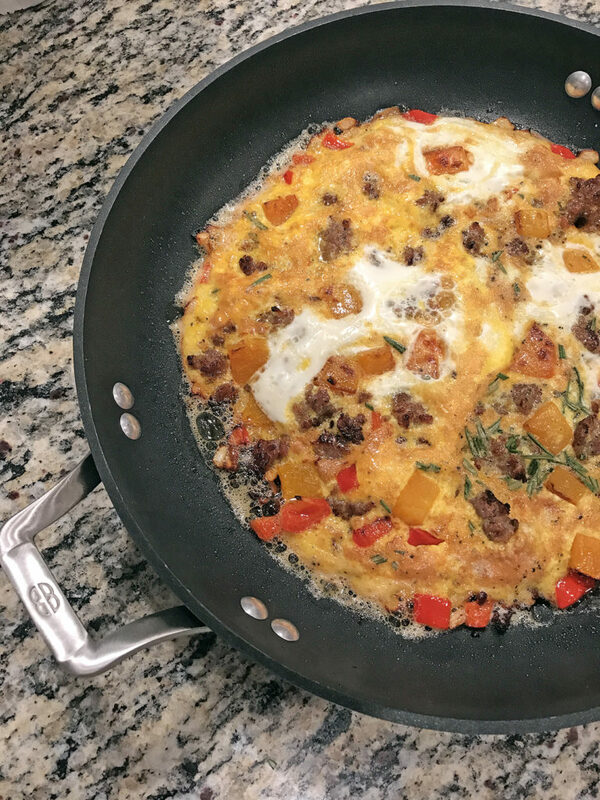 This ONE for a sausage and butternut squash frittata was really flavorful! And THIS recipe for steak fajitas was also yummy. 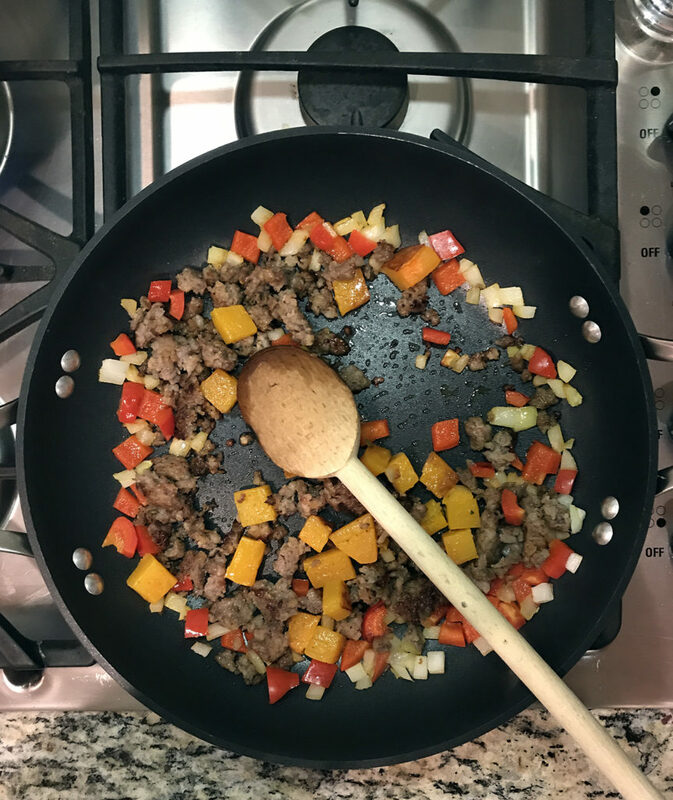 I think our favorite Whole 30 recipe that I found on Pinterest was THIS ONE, though…really, you can’t go wrong with bacon AND sausage! Eating out was a bit of a challenge! I met some friends for lunch one day and ordered a roasted vegetable salad on a bed of spinach. It’s actually my “go-to” at this local restaurant, so I was very content with ordering it. We went to see the new movie “The Post” over the weekend, and decided to go to Panera for a quick bite to eat following the movie. Let me tell you Panera is not an easy place to eat if you are eliminating dairy and grains. We did find a vegetable soup on the menu and ordered that. However when it was served, there were tiny pieces of tube pasta in it. Phillip did a good job of eating around them! I highly recommend the movie, though…the soup, not so much. Okaay, I did have one low moment on Wednesday evening…I wanted bread. Like I REALLY wanted bread so much that I thought I was going to cry. I ate a banana and tried not to give into my carb craving. It’s only been seven days, but I do feel better. More energy. Less stomach bloat. Fewer sugar cravings. GREAT job! Have wanted to try the Whole 30 plan myself, I just haven’t gotten that organized and mentally prepared!! I’ll be following your journey closely so I can learn how to do it! Keep up the good work! Thank you, Tammy! I’m ending week 2 of it, and I think my sugar cravings have finally subsided. You are so disciplined that I know you would have success with this elimination eating plan.